Earlier in July, I spent a day slugging through hawthorns on one of Nova Scotia’s remnant intervale (floodplain) forests looking for flowers of the now rare wild leek. The intervale forests are remnant because the first European settlers liked to settle or graze their cattle on intervale land. We also dyked the intervales, dammed rivers and continue to build on floodplains, although there is a move away from that because of floods. Wild leek about to bloom (left) and wild coffee, post bloom. Leaves of the early emerging wild leek die back by mid-summer when a flowering shoot is sent up. 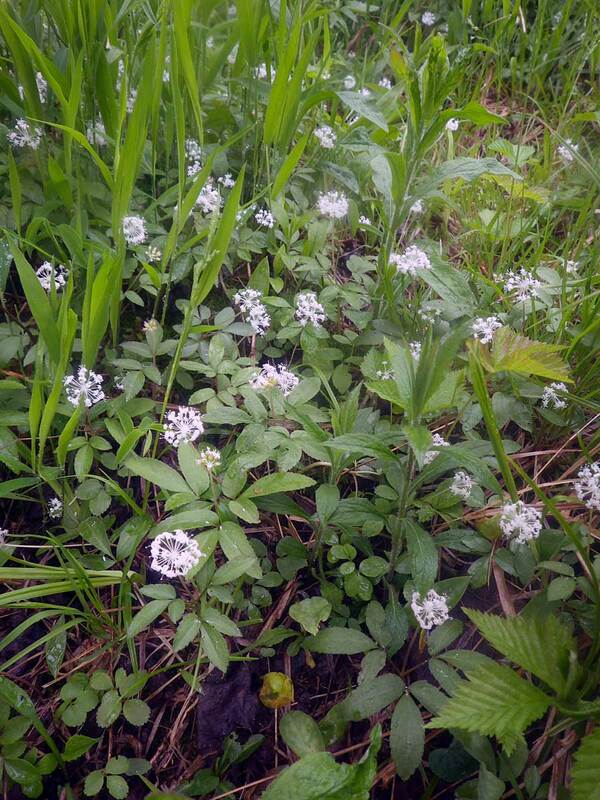 Wild leek is traditional food of the Mi’kmaq; wild coffee may have been used medicinally. I found the flowering leek which was no surprise as I had viewed it in vegetative abundance on my first visit to this site, in late May. My partner in this exercise wanted to see wild coffee (also known as horse gentian). It also occurs on drier land, but is still not very abundant in Nova Scotia. 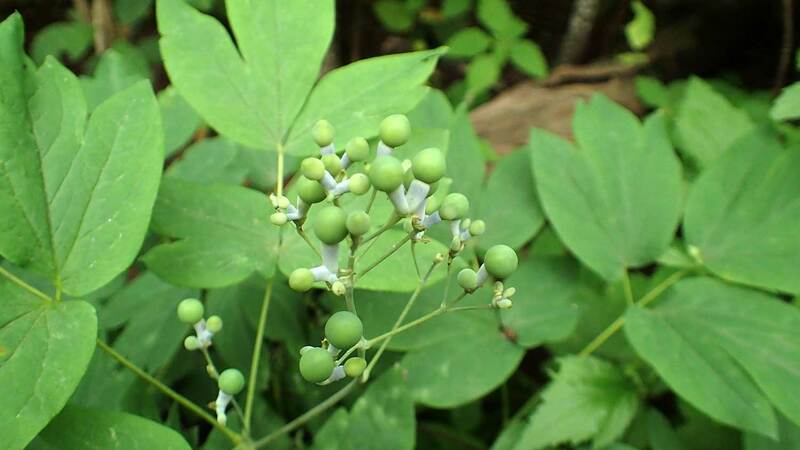 We found it in abundance in the intervale as well as by an upland trail nearby. This stump, roughly 4.5 feet in diameter, was likely cut within past year. Wild leek is nearby; dandelion has already moved in. 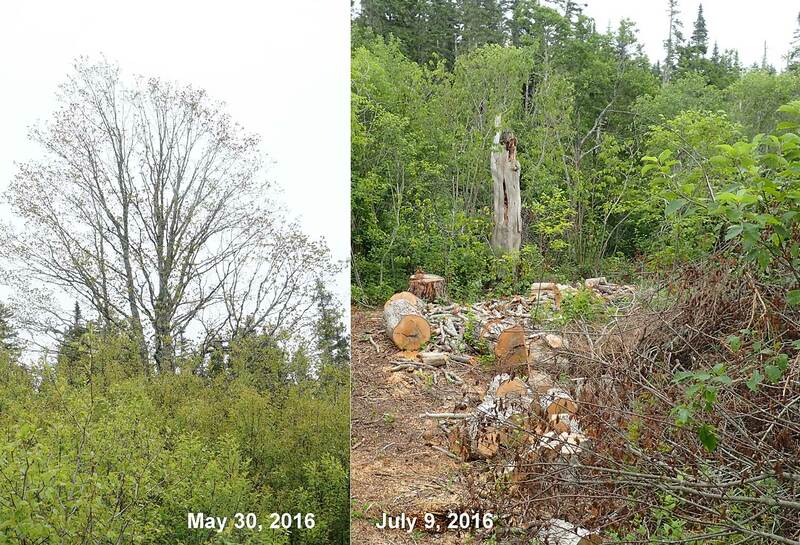 Sadly, when we visited the site in May we saw that some large sugar maples, which once stabilized the intervale and provided a protective canopy for the intervale herbs, had been cut down over the last few years. 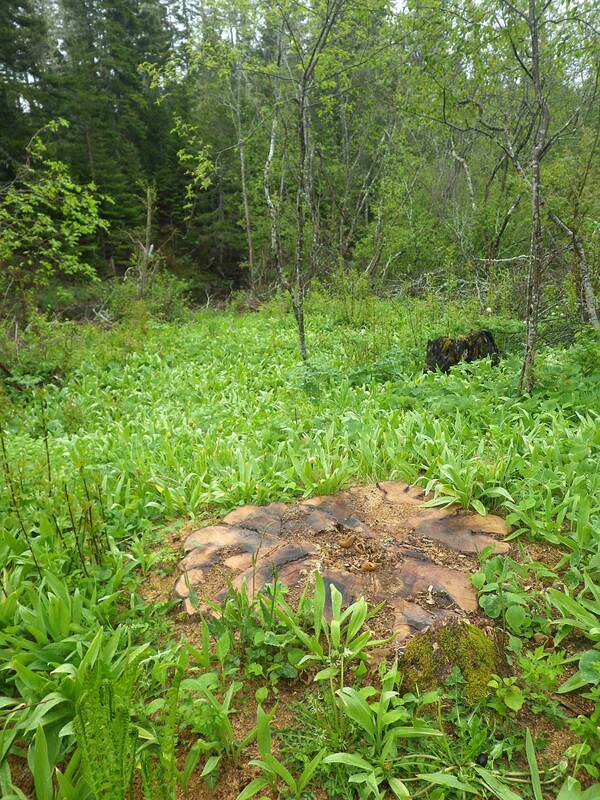 Dandelions had already moved into an opening created by the cutting of a 4.5 ft (1.4 m) diameter sugar maple, likely within the last year. When we visited the site in July, the intervale herbs were clearly stressed by their direct exposure to the sun. In May there remained one large red maple on the site. On this occasion in July I looked for it above the bushes and couldn’t see it. I walked through the dense thorny bush past the large sugar maple stump into a large clearing that wasn’t there in May. Large hawthorn bushes lay prostrate on the ground with 1-2 foot, freshly sections of the red maple amongst them. Some clippers and a small cart were nearby. I counted the rings on the 1.5 ft (46 cm) diameter stump: it had been 82 years old. Walking closer to the river, I found another freshly cut, smaller red maple, age 20 years. The last large hardwood, a red maple, was recently cut. Except for the dozen or so trees that had been cut down perhaps over the last 5+ years, this intervale site was not marked or worked in any way and an adjacent hay field was growing up in hawthorn. It’s quite likely the trees were cut by someone other than the owner who I was told had died within the last couple of years. I suspect the cutter knew nothing about the rare plants that depended on those trees, and that the tree was not cut for recreation or out of spite, but out of need. I certainly can’t blame that individual for cutting down the tree. We are collectively responsible for not valuing nature sufficiently that we take the time to know the species and individuals around us and to care for them. It wasn’t always that way. The Mi’kmaq valued these lands and species in their natural state. 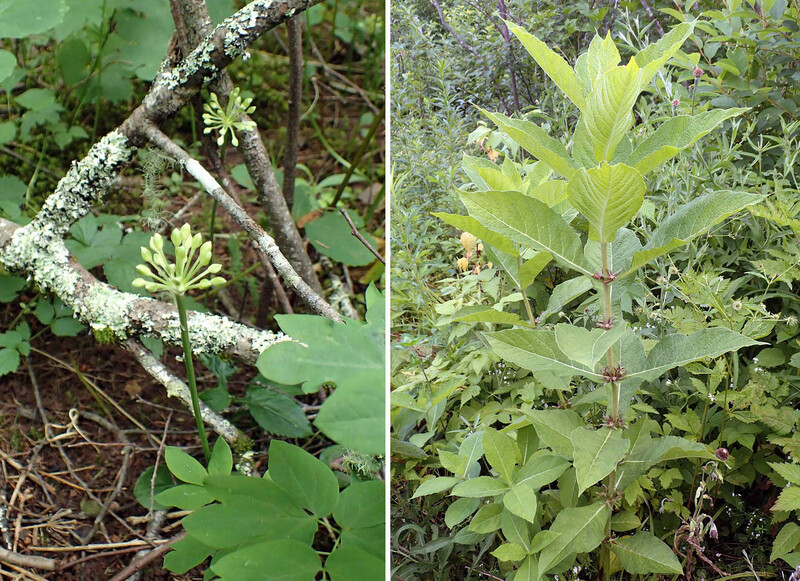 Many of the intervale herbs and bushes were used for food and medicine; some may have been propagated in the intervales and some may have been brought to Nova Scotia though trade with more southerly groups. The European settlers did a job on the natural landscape, but by the late 1800s, there was a new appreciation of native flora and fauna with nature observations being an important component of school curricula. A paper in the 1903 volume of Scotia Institute of Science Proceedings entitled Early Intervale Flora of Eastern Nova Scotia, begins with “Information regarding the distribution of several of our most interesting specimens of flowering plants has been so greatly extended of late, especially the increased attention given to this subject in the public schools, that some generalizations are becoming possible…”. My grandfather’s scrapbook from that era is replete with nature articles cut from newspapers. But this is 2016. Schools in both rural and urban areas teach more and more about the inner workings of the cells, and genes, and less and less about the life right around us. So it’s hardly surprising that about 50% of homes in my middleclass Halifax neighbourhood put herbicides on lawns to control “weeds” such as white clover and dandelions when we need them more than ever as food for pollinators, or that a tree is cut on an intervale in a rural setting or that our freely elected government promotes the most bio-destructive practices of all, clearcutting of our Acadian forest, even on forested wetlands. Where does that leave this one little intervale and its assemblage of common and rare herbs? It’s a bit of race against time… will shading shrubs such hawthorn and alder grow up quickly enough to favour the native herbs over the invading weedy species? Will DNR give any attention to the site? Can it be purchased and protected otherwise? Perhaps, and I understand some efforts are being made in that regard. I hope they work. In the meantime, I like to think that some future generation would be abhorred by the thought of applying herbicides to lawns (or any turf), or cutting trees on our precious forested intervales.